Gold is flat this morning having seen a decent gain in the past few days recovering ground above the $1600 level. At $1623 this morning the bulls seem to being taking a respite for now and will probably wait to see the outcome of the NFP before committing any further. The gold futures market has done well out of the last few days as a bit of risk appetite for the precious metal returns and it also recovers some of its safe haven status. Up again this morning at $1621 the levels the bulls will be watching to the upside are $1634/40 and to the downside $1609/1594. 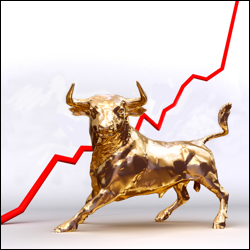 Gold has the wind in its sails on the commodity CFD markets as the yellow metal returned back above the $1600 level yesterday. Still below its 200 day moving average, which sits at $1630, this is the next target for the bulls but there could be quite a bit of resistance here. The precious metal is trading at $1616 this morning so other key levels to watch are $1590/80/60 to the downside and $1621/30 to the upside. Crude had a big jump higher too yesterday taking Brent back above $112 as geopolitical tensions between the US and Iran increased as the Middle Eastern country stepped up its threats to block oil shipping through the Straits of Hormuz. This morning Brent remains above $112 at $112.30 so support and resistance is seen at $109.55/107.60 and $112.80/113.85 respectively. Considering that the downward channel remains intact there might be limited upside, but further strength can't be ruled out if tensions continue to mount. Gold suffered some selling in between Christmas and New Year but has recovered well in the past few sessions dragging the commodity market back towards the $1600 level. At the time of writing the yellow brick is trading at $1586 and has been benefiting from the rise in geopolitical tensions in Iran as the safe haven status comes back into play somewhat. Support and resistance is seen at $1560/42 and $1600/13 respectively. Brent crude oil has seen a spike as Iran carries out its missile tests, but also the Chinese data and general risk on start to the year has helped lift the black stuff. At the time of writing Brent is trading at $109 on the figure and despite spending the latter part of 2011 trending a little lower the average price for crude was a record and many expect the same again in 2012. Support and resistance is seen at $108.20 and $109.45 respectively. In commodities futures, gold continued its downward fall yesterday. We probably had a strengthening dollar to thank for a large portion of the fall. The fact that the yellow brick also continues to sit below its 200 day moving average doesn't help, as this acts as an additional weight pushing it down. We are now not too far from the spike down we had back in September, around $1,536. Given that markets do have a tendency to re-test spikes, it would certainly seem reasonable to view this as a short-term target. The long term trend is still up for the yellow metal, although the recent sell offs are requiring a re-adjustment of just where to place that long term trend line. $1,530 / $1,536 are strong support levels, while we could see resistance around $1,600 if we bounce form here. Elsewhere, in crude oil spread trading, the commodity continued its roller coaster ride and got sold off yesterday. After many felt that Iran's threat to close the Strait of Hormuz, through which one third of the world's seaborne oil trade passes, was an empty one. The price of Brent crude oil fell almost $2, to trade at $107.56, while US crude retreated to $99.36 after trading above $101. This morning Brent is trading around $107.90. Support and resistance over the near term still stand at $107.35, $106.15 and $109.45, $110.25 respectively. Gold lost a little bit of its shine yesterday as it dipped below $1,600 again. December is turning out to be a poor month for the precious metal as it's on course for an almost double digit percentage decline. Over the longer term gold remains underneath its 200 day moving average which is proving a nervy sign for the bulls. A close back above $1,628 will give them more confidence but as long as it remains below this technical barrier then gold's multi-year bull market will be called into question. The last time gold went below the 200 day moving average was in 2008 and we all remember what happened then. This morning the metal is softer again at $1,585. Crude bulls enjoyed the continued threat by Iran that they will close the Straits of Hormuz and prevent the transportation of oil through this vital part of the Middle East. Brent jumped above $109 a barrel and a one point looked like it might test $110 before retreating from its highs. This morning black gold is a little lower at $108.50. Support and resistance over the near term are seen at $107.35, $106.15 and $109.45, $110.25 respectively. US crude oil was initially lifted by the announcement of the ECB's bond buying program, as well as signs that the US economic recovery is staying on course. However, falling oil imports...» read more. Mirroring a quiet trading session for the Dow and crude oil yesterday, gold closed lower as commodity market participants were left on stand-by. Friday's renewed speculation that central banks will add more quantitative easing encouraged...» read more. The price of gold futures plunged to its lowest level in three months as anxious investors continued to digest the effects of diminished chances of QE3 from the Fed. Gold fell almost $58 with traders fleeing the equity markets. Some would have thought that...» read more. In commodities, gold continued its downward fall yesterday. We probably had a strengthening dollar to thank for a large portion of the fall. Elsewhere, in crude oil futures, the commodity continued its roller coaster ride and also got sold off yesterday. After many felt that...» read more.